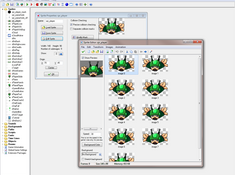 Found 18 file extension associations related to GameMaker and 16 file formats developed specifically for use with GameMaker. Game Maker is a program for creation of simple computer game developed and sold by YoYo Games. It is available in versions for Windows, Mac OS X and HTML 5. Game Maker allows users to make exciting computer games, without the need to write a single line of code. Making games with Game Maker is a lot of fun. Using easy to learn drag-and-drop actions, you can create professional looking games within very little time. You can make games with backgrounds, animated graphics, music and sound effects, and even 3D games! And when you've become more experienced, there is a built-in programming language, which gives you the full flexibility of creating games with Game Maker. What is best, is the fact that Game Maker can be used free of charge. If you need more information please contact the developers of GameMaker (YoYo Games), or check out their product website.